When decorating a nursing home room you want to create a home away from home. The rooms are usually very small, so only a few cherished items can be used. With a little space planning, you can make the room comfortable and be inviting. 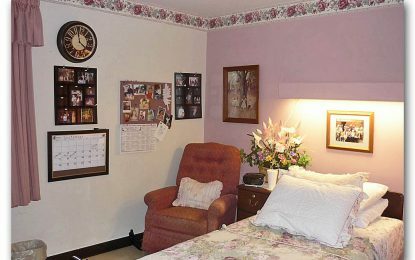 Decorating a nursing home room is a challenge because the rooms are quite small and there are facility rules to be followed. Recently, I had the challenge of decorating a nursing home room for my mother. My goal was to create a comfortable cheerful space, using her most cherished items. The room came furnished with a bed, nightstand, armoire and a bulletin board. A roommate shared the space so we needed to keep all of our decorating to one side of the room and coordinate the look to match the roommate’s side. Below are some ideas to help you create a home away from home. Step 1: Find out the Rules and Regulations of the Facility. What is the policy for hanging items on the wall? Are you allowed you to change the window treatments? Does the facility provide pillows? Linens? What type of electronic items can you bring? What type of furniture can you bring into the room? Start by choosing a color scheme and theme for the room. Coordinate the existing paint color of the room to your bedding and accessories. 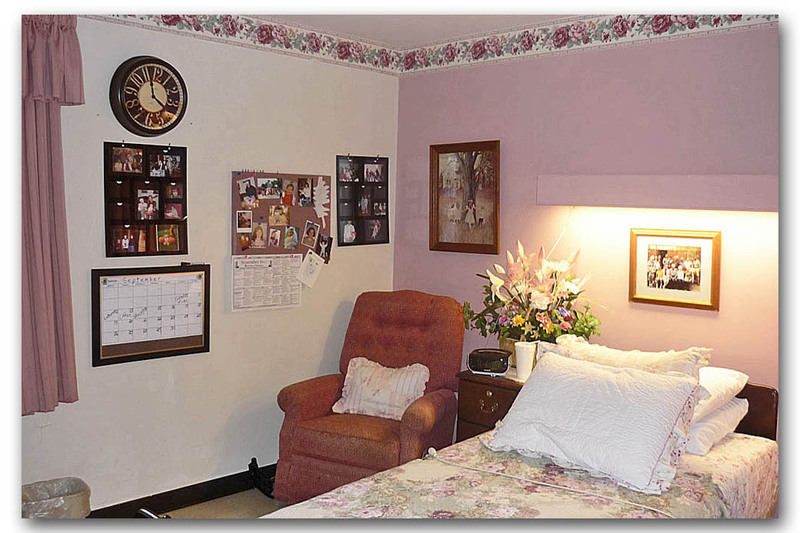 For my Mother’s Nursing Home Room (shown above) the walls were a pink tone with a rose pattern wallpaper border. The home did not allow us to paint the walls or change the wallpaper so we chose a light pink color and floral theme for our bedding set and accessories. When selecting a color scheme – theme select one that matches the likes and personality of the resident. Use the bed as the focal point for your decorating because it is the largest item in the room. Select bedding that will brighten the room and reflect the lifestyle interests of your loved one. As the seasons change so can the theme of the bedding. A gardening theme in spring can easily change to a hunting theme in fall. The holidays can be celebrated with a decorate duvet that is easy to change. A nursing home resident spends a considerable amount of time resting in bed. Incorporate a variety of pillows for support and use soft pillowcases for comfort. The standard hospital bed will fit a twin or full comforter and blanket. NOTE: Sometimes a Full or Queen Comforter will work on a hospital bed because it covers a larger area and works well when a skirt cannot be used. Verify the bed size before purchasing your bedding. Measure the size of the bed to verify if a larger comforter will work. Choose bedding that is easy to wash and simple to make the bed. Personalize the space by using a few cherished items that remind the resident of their home and life. My mother loved a painting she owned that depicted three children dancing around a tree. She said it always reminded her of her children on the farm. We decided to hang that piece above her chair. NOTE: Be mindful that the resident will need to see and reach most of the items in a room. Often these items need to be wheelchair accessible so keep things within an arm’s reach from a sitting position. When lying in bed the resident should be able to see a clock and something pleasant and inspiring to look at. Before bringing your own furniture to the home ask what type of furniture the facility allows. Most homes allow you to bring in an easy chair or recliner. A power lift chair can add comfort and support for the resident. Traditional Recliners can be hard for a frail person to operate the footrest. It will fit nicely in the corner. Keep a small blanket on the back of the chair to use for daytime naps or a lap blanket. If possible place a nightstand or end table next the chair to hold everyday items. The nightstand should hold a few items such as a cheerful basket of silk flowers, pictures, a clock, tissue box, water, and phone. Plants add softness to space. Select a silk floral or a silk plant that can be set on the windowsill, dresser or a shelf. Place some greenery along the top of the armoires to add some softness to the room. Most nursing homes do not allow live plants and flowers due to the allergens and mold that they produce. Create a collage of family pictures to hang on the wall or to set on a shelf. Some homes do not allow anything hung on the walls. If that is the case, create a collage of pictures that will easily fit on the night stand and not take up too much space. Put together a simple photo album of favorite memories in a drawer or on a shelf. A digital photo frame is a nice touch that takes up little space but adds many memories. There are digital photo frames that you can send pictures to from the internet. Use the wall space to display family photos, favorite pieces of art, a calendar and a bulletin board. Decorate the bulletin board with some inspirational sayings or favorite pictures and greeting cards. Create an about me page for the staff to read. 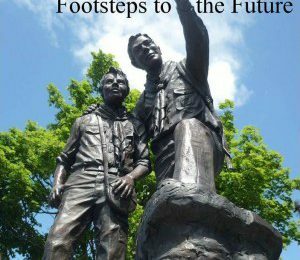 Include such things as what type of work they did, favorite hobbies, favorite color, pets and interesting things about their past. This will give the staff and visitors ideas for conversation with the resident. Seniors often lose track of what day it is. A clock that has large letters and displays the date makes a great accessory for the room. Hang a large calendar on the wall. Mark special events and holidays in large letters for the resident. Place a small television in the room that will fit the space allowed. Attach a VCR or DVD player. Select some old but favorite movies and shows to keep on hand for watching such as “The Wizard of Oz,” “The Sound of Music” or the Lawrence Welk Show. 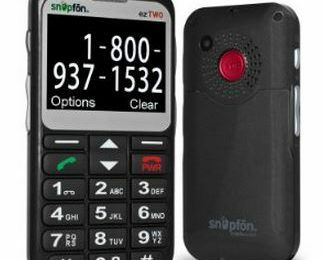 For those who have trouble working a remote choose a simple remote that just has an on-off, volume and channel changer. Tag each item in the room with the resident’s name. Use sticky notes or labels to help your family member learn their new surroundings. Such as; help button, phone number and the name of the place that they are in. Purchase a DVD player and some old time movies to watch. Be sure that the device is easy to use. Most nursing homes do not allow you to change the window draperies. When purchasing furniture such as easy chairs choose the smallest size that the family member is comfortable in to fit in the space. Change the bedding to match the seasons. This gives a fresh new look to the room.